Adrenalin Addo’s zip line is the highest, longest and fastest double zip line in South Africa. Twin cables – each 500 metres long – descend from an impressive departure tower perched 70m above Addo’s Sundays River. The departure tower is reached via a short raft ride across the Sundays River and a 10-minute hike through Addo’s indigenous bush. Breath-taking views across Addo’s valley of citrus are the reward from up high before it’s time to get into position, get ready and just let go. A hands free zip line, riders will reach an average speed of about 60 km/h, some exceeding 80 km/h. An automatic breaking system at the end of the zip means that you do nothing but enjoy the ride!Fast, fun but safe, this exhilarating ride begins from a vantage point 60 meters above the Sundays River, overlooking a valley of citrus. Brave enough to take that initial launch, 500 meter twin zip lines fly two riders over the river at up to 60 km/h. An automatic breaking system at the end of the zip means you do nothing but enjoy the ride! 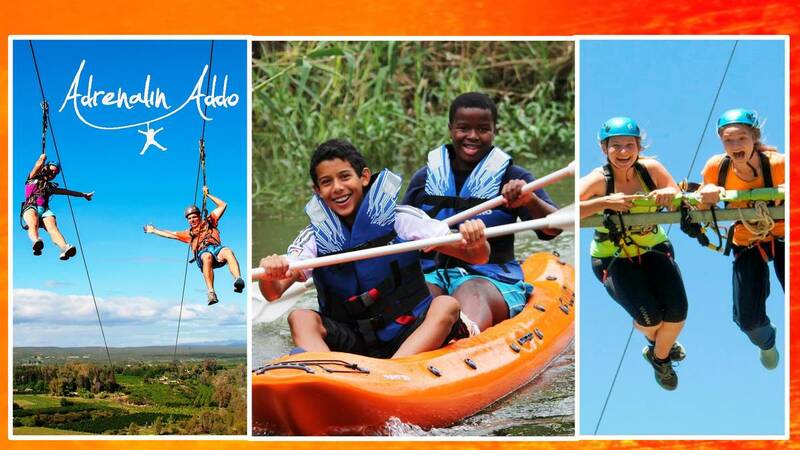 Adrenalin Addo’s giant swing is the first of its kind in South Africa and guarantees to swing you to new heights. After being hoisted up 18 metres high, the rest is history as they say. A release into oblivion, the sky your limit, say goodbye to your stomach! Two riders at a time can enjoy the swing and put their nerves to the test. WhereTake the N2 towards Grahamstown and then take the R335 to Motherwell (same directions for Addo Elephant National park). Continue for about 40 km until you reach the village of Addo. Just beyond Addo village, turn left onto the R336, heading towards Kirkwood. After 12km, look out for the Adrenalin Addo sign board and then follow the orange signs. Guests or SpectatorsWe have a beautiful deck overlooking the Sundays River where you can enjoy a cool drink while spectating the zip line.